Khansa Khalil Fourth year medical students, Rawalpindi Medical University, Rawalpindi. 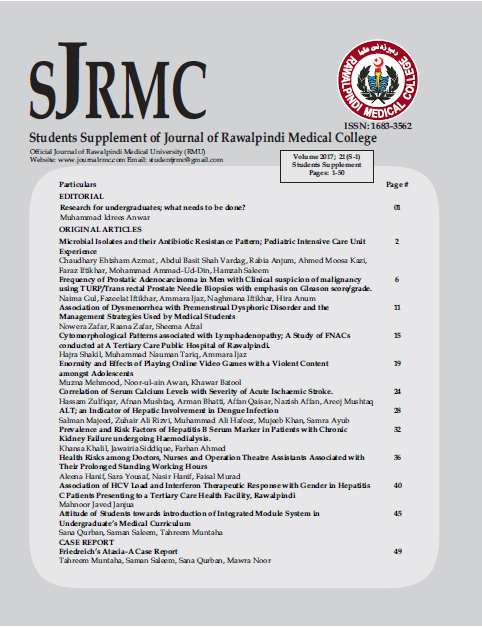 Jawairia Siddique Fourth year medical students, Rawalpindi Medical University, Rawalpindi. Background: Association between hepatitis B infection and chronic kidney disease is multi-factorial. Hepatitis B infection has calamitous effects on health of dialysis patients as compared to general population and this study is conducted to determine the proportion of non-vaccinated patients who became HBV positive within 7 years of initiation of haemodialysis and also to determine frequencies of various risk factors of Hepatitis B in these patients. Methods: This descriptive cross sectional study was conducted at three tertiary care hospitals of Rawalpindi from May-September 2016. The study participants were 65 known cases of chronic kidney failure undergoing haemodialysis on regular basis who were confirmed to be HBV negative at the start of dialysis or within 6 months of initiation of dialysis. All the relevant information was taken from the records as well as by interviewing the patients and recorded in the structured checklist. Data was then analysed in SPSS and prevalence of HBV and associated risk factors were determined in these patients. Results: Out of 65 patients, only 1 patient (1.5%) had become HBV positive whereas remaining 64 (98.5%) had remained HBV negative. The duration in months in this patient to become HBV positive was 32 months. Smoking 14 (21.53%), Diabetes 16 (24.61%), Hypertension 11 (16.92%) and Blood transfusion 15 (23.07%) were the common risk factors observed in all patients while the only risk factor present in HBV positive patient was hypertension. Conclusion: Prevalence of Hepatitis B in non-vaccinated, haemodialysis patients was observed to be low while the common risk factors of Hepatitis B infection observed in dialysis patients were diabetes, hypertension and blood transfusions.